Tonga Nguyen knows what it’s like to start your life over – and over again. She has found success after coming to a new country, learning a new language, experiencing a new culture, buying a new business and then yet another new business. And all before she was 26 years old. 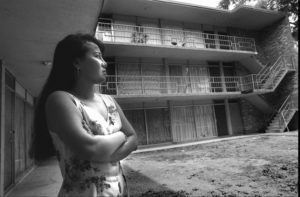 Tonga, her parents and two brothers came to Memphis in 1990 as South Vietnamese refugees fleeing the brutal North Vietnamese Communist government. Unlike immigrants, refugees are designated by the United States government as having documented political or religious persecution that could cost them their lives in their native land. The family arrived in their new homeland with only $50, minimal possessions, and hopes for safety and freedom. They were placed in an apartment on Court Street in Midtown Memphis and received additional help from the agency that resettled them, Refugee Services of Associated Catholic Charities. Tonga spoke little English when she arrived in the United States. Determined to receive an education, she entered the 10th grade at Central High School when she was 18 years old. She tenaciously pursued her studies and spent many hours away from school in the library. Tonga graduated from high school in 1994 at the age of 22. She became a U.S. citizen in 1995. While still a student, Tonga worked after school in the office of the apartment building where the family lived. Eventually she was promoted to manager. After graduating, it was clear that Tonga was a natural entrepreneur. She convinced her brother to help her purchase a grocery store in North Memphis. It proved to be a dangerous business. The family sold the store in 1995 after numerous robberies, which resulted in an employee being killed and her father being critically wounded. Tonga was unwilling to give in and pursued another business endeavor. She used the proceeds of the sale of the grocery store, her family’s savings and other financing to purchase two apartment buildings with 80 units on Court Street. In 1996, just six years after arriving in Memphis with nothing, Tonga and her family purchased the building where they first lived. Her position evolved from tenant to manager to landlord. Today, in addition to her duties as a landlord, she manages more than 400 apartments in other buildings in the neighborhood for Roberts Properties.